The complexity of dealing with multiple devices that first need to be connected and then need to communicate with each other results in millions of hours burned on customer care support calls and visits to customer homes. The Speedport NEO is an innovative plug-and-play router that combines a broadband modem, power adapter, telephone base station, power line adapter, and router into a single simple device. Setting up a home Internet connection has never been easier. Simplicity is the core principle behind the new Telekom Design Philosophy. Through comprehensive research and monitoring of the customer journey from sale to set-up to day-to-day usage, we identified the major issues and needs of our customers. We paid meticulous attention to detail and removed anything that could possibly distract or confuse the consumer. We questioned every single aspect of the product, right down to the very last detail. We left nothing to chance. The Speedport NEO experience starts as soon as you open the box: There’s no external power brick to connect, no cables, no unnecessary packaging, no physical ports, nothing to plug into the router, and no clutter! 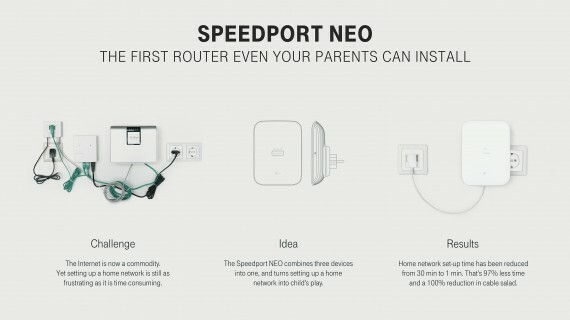 The set-up is automated and as easy as setting up a toaster: Simply plug the Speedport NEO into an electrical socket and connect the broadband cable. Everything else happens automatically. The integrated power line adapter immediately turns the home’s electrical circuitry into a network capable of speeds up to 750 megabits/second. Due to its minimalistic design, the Speedport Neo blends perfectly into any home environment. The interface features just two LED displays and provides maximum clarity on the status of the device. The Speedport NEO is the first child of Telekom’s new Design Philosophy and it was an instant success. The router boosted sales and customer ratings while reducing the average time for initial home network set-up by more than 97 percent – from 30 to just 1 minute. It almost completely eliminated the need for service personal to visit customers at home for set-up support. Equally as important, the Speedport NEO makes a major contribution towards the preservation of our environment. By combining five devices in one, it uses far fewer electronic components, conserves resources, and minimizes physical and visual pollution throughout the product life cycle. It also results in a dramatic reduction in power consumption and cuts the physical space required by 66 percent.